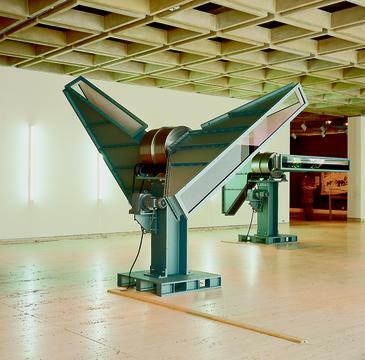 The sculpture, 'Der Unwiederstehliche Zustand der Ruhe', is a container system resting and rotating on rollers. Viewing it along its axis, it is possible to look through it. It is filled to half capacity with a reddish fluid. The unit rotates so slowly that the liquid adapts to the changing sectional shape of the container without a hint of turbulence. Whilst the size and shape of the surface vary continually, the horizon remains constant. This gives rise to the impression that the construction is cutting like a kind of radar system through a liquid that is present throughout the location, but invisible except where it is revealed, in the window-like openings of the apparatus. Several of these objects, ideally to be placed in a constellation to be decided in situ, will enhance the impression of a common horizon existing unseen.